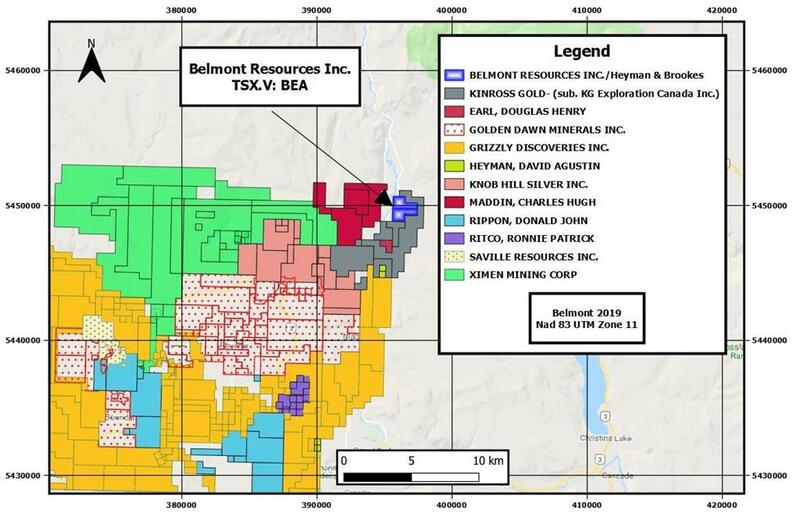 VANCOUVER, BC / ACCESSWIRE / March 28, 2019 / ("Belmont Resources Inc. ("Belmont" or the "Company") (TSX.V: BEA; FSE: L3L1; DTC Eligible – CUSIP 080499403). Belmont has entered into an arm´s length acquisition agreement with David Heyman & Clive Brookes (the "Vendors"), to acquire 253.34 hectares of mineral claims which is part of the former Pathfinder Property, located in southern British Columbia, approximately 18 km north of Grand Forks, in the Greenwood Mining Division. The property covers a highly mineralized area at the northeastern edge of the Boundary Mining Camp; also known as the historically productive and larger Republic-Greenwood Gold District. Copper and gold mining in this camp dates back to the turn of the century. More recently, other companies carrying out exploration drilling in the area have announced outstanding intersections of precious metals.(ie. Ximen Mining Corp. -"TSX.V:XIM";GGX Gold Corp.- "TSX.V:GGX": and Grizzly Discoveries Inc. "TSX.V:GZD"). A great deal of historical prospecting, outcrop sampling, diamond drilling, and, more recently, magnetic survey and soil sampling has been carried out throughout the property and there is evidence of old mine workings in several locations on the former Pathfinder property, some going back to the late 1800´s. In the late 1990´s systematic and integrated exploration programs by Cassidy Gold Corp resulted in the discovery of several vein and skarn showings/zones with geophysical and geochemical anomalies in the area. Following up on Cassidy´s work, Conlon Resources Corp optioned the property in May of 2000 and carried out more thorough soil sampling and geochemical analysis on the property. The work by Conlon, carried out and documented by R.C. Wells, P.Geo. of Kamloops Geological Services Ltd (Dec 2000 report) identified several prospective targets and recommended further study, including core drilling of high-probability areas. In R.C. Well´s December, 2000 report for Conlon he states; "The gold-silver mineralization at Pathfinder has several features in common with the past producing mines in the Rossland mining camp, 60 km to the southeast. This camp was historically the 2nd largest BC gold producer. Sulfide-rich ores consisted of massive pyrrhotite-rich replacement "veins" averaging close to .5 ounces per ton (17.1g/T) gold, with significant Copper and Silver." All previous work is of a historical nature, and may not have been conducted under NI 43-101 standards, therefore assay results cannot necessarily be relied upon. Belmont intends to confirm the reported mineralization on its claims with the Company´s own sampling program. Significant historical information/ data will be compiled as soon as possible to assist in the 2019 exploration program and completion of an updated geological report. Jim Place, P.Geo.,CEO comments: "This was an opportunity that Belmont could not pass up. On the heels of a very positive Vancouver Resources Investment Conference ("VRIC"); the Prospectors & Development Association of Canada ("PDAC") and with the optimism in the market surrounding growth in gold prices, mergers and acquisitions, and mine development; we were presented with a portion of the Pathfinder property. Other exciting gold news from companies exploring the historic Greenwood area mining camp have received much investor´s attention recently." Other active companies in the Greenwood Camp include Golden Dawn Minerals –(TSX.V: GOM) and Grizzly Discoveries Inc. (TSX.V: GZD). Under the terms of a September 23, 2015 agreement, KG Exploration (Canada) Inc. (the subsidiary of Kinross Gold Corp) ("Kinross") can earn a 75% interest in certain mineral claims within Grizzly´s Greenwood Gold Project, covering approximately 27,000 hectares (approximately one third of the area comprising the Greenwood Gold Project), by incurring US$3 million in exploration over a 5 year period; with a minimum of 3,000 metres of diamond drilling and expenditures totaling US $750,000 by September 23, 2017 (which has been completed). Kinross has incurred approximately Cdn.$1,280,500 in exploration to date (see GZD news release dated February 25, 2019). Kinross is planning further exploration within the Greenwood option for 2019. - A 1.5% Net Smelter Return Royalty ("NSR"). The Company many acquire one-half of the NSR for $1 million upon commencement of commercial production on the Property. The Agreement is subject to TSX Venture Exchange (the "Exchange") approval.